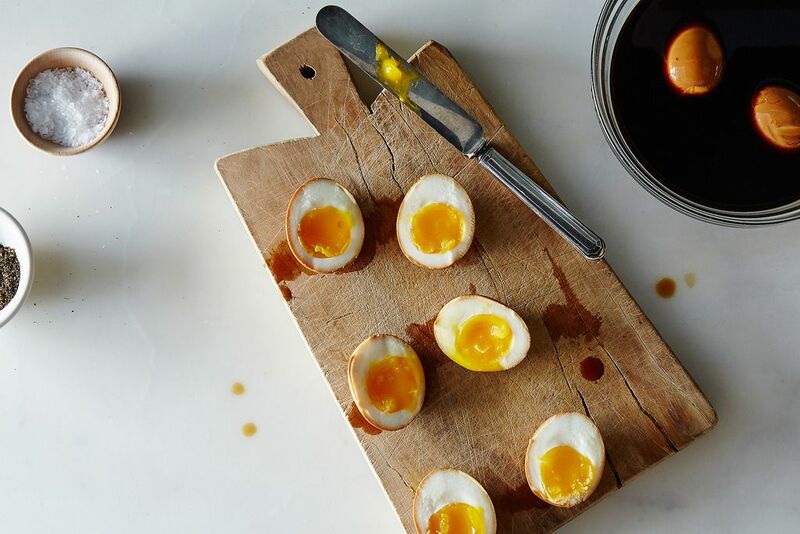 Today: How to make perfect, Momofuku-style soy sauce eggs—the simple ramen shop staple that will be your new Not Sad Desk Lunch (and last-minute breakfast, dinner, and midnight snack). This recipe goes out to all those times that you've stooped at the open fridge door, hoping for a respectable dinner to show itself. And to all the 1PMs at your desk in a scramble for takeout, cursing yourself for not planning ahead. To all the salads that aren't quite filling enough, the sandwiches that lack heft, the toast that stops short of fueling you through the morning. In the interest of being one step ahead of all of those moments, take a break on Sunday (or tonight! 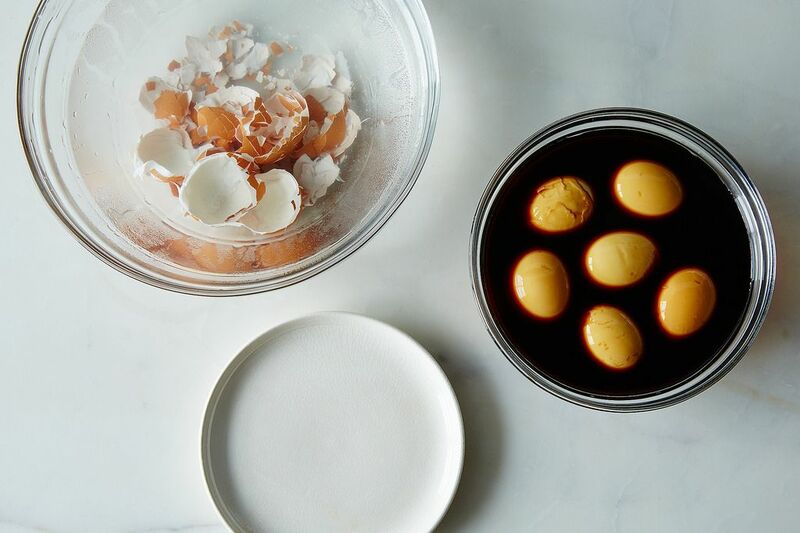 ), and make soy sauce eggs, or shoyu tamago. Make as many as you can eat in a week, which—you'll soon realize—is a lot. If you've ever lived in Japan or tackled making your own ramen, this simple fridge-enhancing trick won't be news to you. (But why didn't you tell us sooner?) 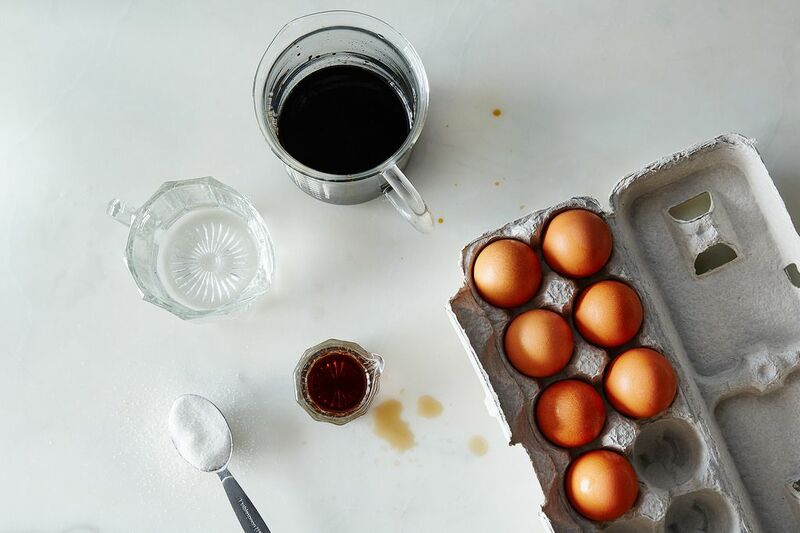 For the rest of us, this recipe—Christina Tosi's version of Momofuku's standard—requires only four ingredients that you already have, and renders eggs that are virtually perfect in form. The yolks—just thickened, not yet pale and stiff—are centered in firm (but not too firm) whites. You'll submerge them in a soy sauce marinade that will penetrate only as much as you decide to let it. 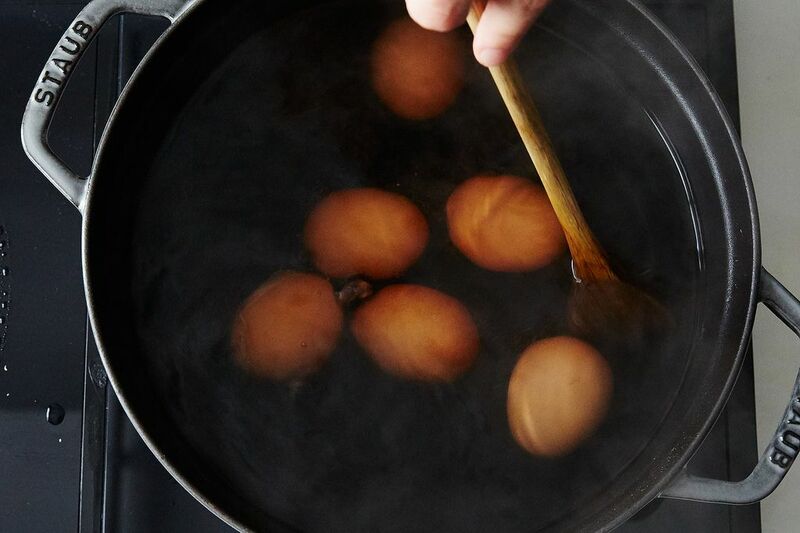 The trick to these model eggs is cooking them exactly 6 minutes and 50 seconds, stirring gently for the first couple minutes to center the yolks via a whirlpool of centrifugal force. By immediately shuttling them to an ice bath, you do away with any variables that might allow them to continue cooking secretly. 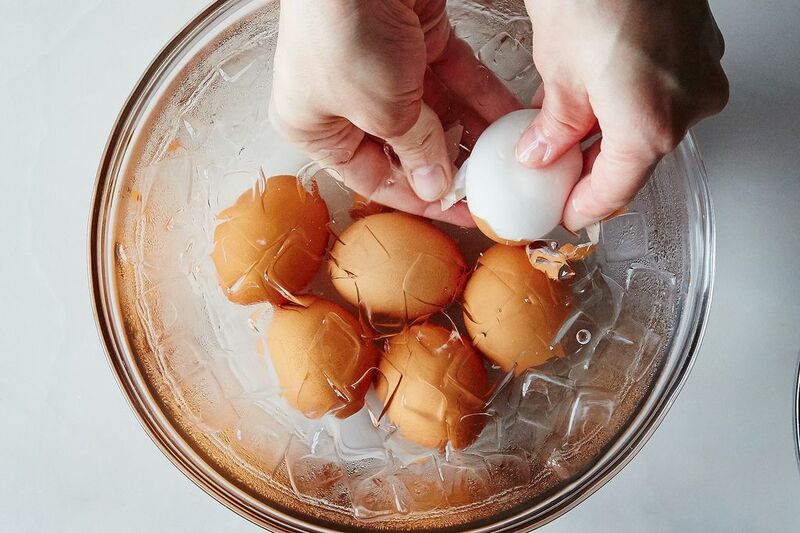 Once the water feels temperate enough to swish your hands around in, you peel the eggs straight in it, to leave the whites smooth and glossy and not lose as many bits to the shell (some bits might go rogue anyway, but the eggs will still taste good). The soak isn't just about salting them, but a more rounded seasoning—a little sweet, a little tangy, but mostly a lot of umami. You can vary the marinade as you like—add sake, scallions, ginger, mirin, garlic, chiles, or rice wine vinegar. What's to stop you? Since these will be your new weekly fridge companion, you'll have plenty of opportunity. 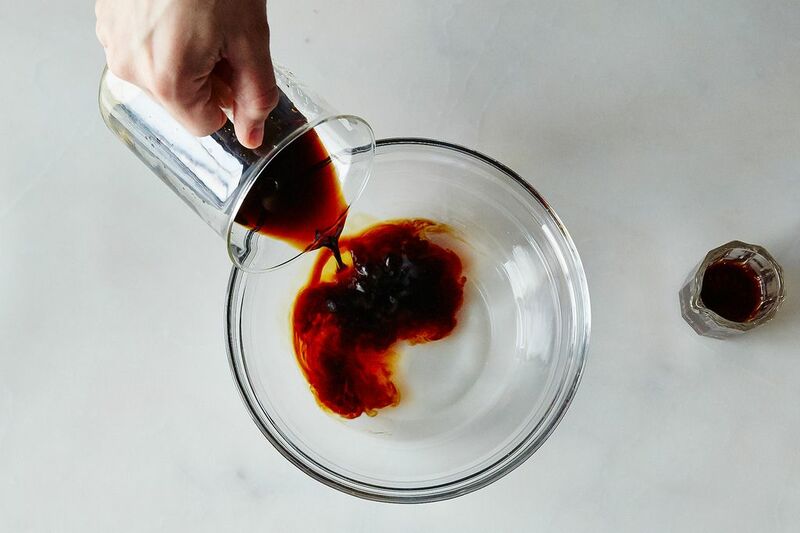 Got a genius recipe to share—from a classic cookbook, an online source, or anywhere, really? Please send it my way (and tell me what's so smart about it) at [email protected]. 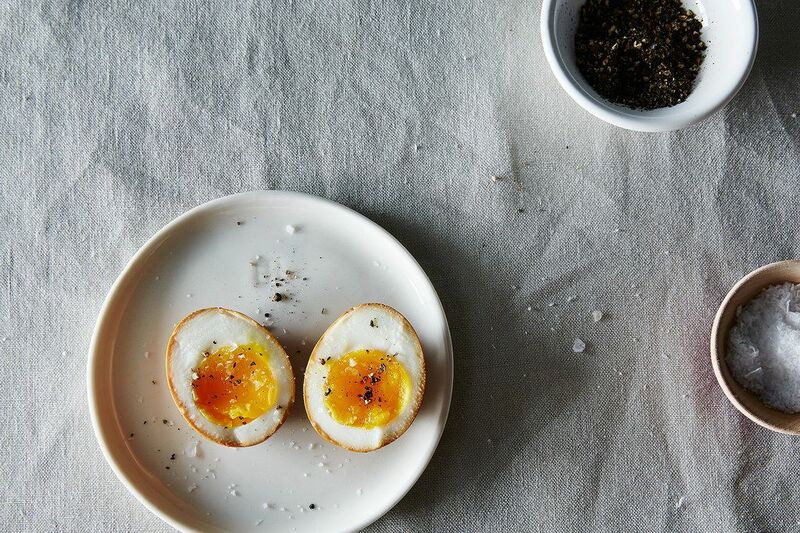 Thanks to Food52er drbabs for this one! If I were to do this, would I have to toss out the marinade after each batch or is it possible to freeze and reuse it? This was surprisingly delicious. Gladly a new fridge staple now. Thank you! Boy, this really went south. Eggs cracked upon being put in the boiling water, far too much white stuck to the shell when peeling and two of the yolks ran out into the marinade... Not an auspicious first try. I made these eggs and could not eat them. Did the recipes as written tried to eat them cold out of the refrigerator with Maldon salt. Could not get past the cold soft yoke and the egg was way to strong of a flavor for me, and not a good flavor. Not sure what Momofuku does with these eggs but I could not eat them. In the trash they went. Maybe Momofuku does not want use to know how to make these eggs. Did anyone really like these? Americans tend to have a problem with soft yokes. I think that is too bad but it still does not help you. Cooking them longer, perhaps 10 minutes, would work. Slicing them and eating them with toast might work. But, if you don't like the flavor, there is not much that can be done. The Chinese make even more spicy or flavored eggs adding star anise or other spices. Here in Japan, they are served as a topping on ramen and are well loved. In China, they are often served chopped with their soupy rice breakfast dishes. You might try using marinade ingredients that you like. Let us know if you come up with a new version! That would be fun! Would a substitute vinegar work as well? Made this with Bragg's Aminos instead of soy sauce (was out of soysauce) and had one for breakfast today with a mandoline-sliced radish. I was whimpering this egg was so good! I eat organic eggs since my stomach seems to like it better and I use this recipe I just use harder boiled eggs I can not stomach runny eggs. I use dark soy sauce also. Its a staple I use when friends come over and want a snack. Queen Mab: I would imagine it would be fine to cook your eggs for 10 minutes, for example, to get a harder cooked egg. I don't see why it wouldn't work. Has anyone tried this with harder cooked eggs? I don't do the runny stuff. I eat this alot and I hard boil mine and do the same thing. I use darker soy sauce I like the dark look. Its good regardless. I hate runny eggs you are not alone. The Japanese make these ramen eggs, but the Chinese make some cool marinated eggs too. I have seen recipes where the raw eggs are marinated in the refrig. first (sometimes for several days) then boiled and served with rice dishes in the morning. The marinades include soy sauce, spices, etc. With eggs straight out of fridge and unsalted water, the yolks were definitely runny. Do you boil in hot or cold watr? From which moment 6:50? I waited until the water was at a rolling boil, and lowered all the eggs in with a wire strainer, counting the 6:50 from there. The yolks were perfect --not runny, just softer than usual. I see no reason at all that people who want harder yolks cant cook them a minute or two longer, it's about seasoning the whites anyway. They are outstanding! A new staple for my fridge. Hailey, BTW that's for soft boiled... so for this recipe adjust accordingly. Do you know if high altitudes will affect the cook time? I'm wondering the same! Have you tried it with a different vinegar?